Why is Solazyme selling its products at Sephora? Algae has been a hot topic in the clean energy community for years; it can be used to produce biofuel efficiently, with minimal water use, and without taking up arable land. But Solazyme, a San Francisco-based algae fuel startup, is expanding its brand by bringing algae technology into the nutrition and cosmetics industries. This week, the company unveiled Algenist, an anti-aging skincare line that uses microalgae compounds as a main ingredient. The idea for the Algenist skincare line came from Arthur Grossman, a Stanford University professor and microalgae expert. Soon after the company’s inception in 2004, the Solazyme team came to Grossman to find out what applications microalgae might have besides biofuel. His response: skincare, primarily because algae successfully protect themselves against the same harsh environmental conditions as humans. So Solazyme set to work investigating microalgae, eventually stumbling upon Alguronic Acid, a compound produced by one microalgae species that protects algae–and human skin–from the environment. The compound is, according to Solazyme, significantly more effective than hyaluronic acid (a popular anti-aging skincare ingredient), vitamin C, retinol, vitamin E, and other anti-aging ingredients in increasing skin elastin production, inhibiting melanin production, and protecting against UV-triggered cell damage. Algenist’s products have also been shown in a third-party study to increase skin smoothness, decrease fine lines, and cut down on wrinkles after just a few weeks of use (I’ve seen the before and after pictures, and they’re impressive). 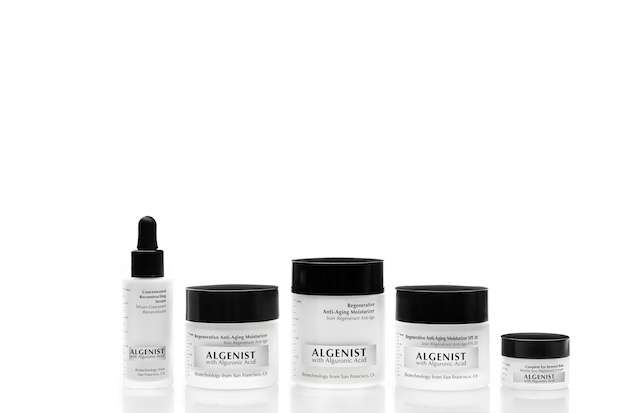 Algenist is, in other words, the kind of line that skincare merchants dream of. But Solazyme decided against selling its wares to the L’Oreal’s of the world. “It’s so different, it has such a unique story, it would have been a shame to sell it to someone,” says Frederic Stoeckel, Vice President and General Manager of Algenist. Instead, Solazyme launched its Algenist division, which has successfully slipped its products into all 800 Sephora stores in the U.S. and Europe (the products go on sale on March 24). Algenist’s products, which include a reconstructing serum, moisturizer, and eye balm, will also be sold on QVC beginning on March 25. The Algenist line is the first series of products to come out of Solazyme, but skincare is only one part of the company’s moneymaking strategy. Still, Stoeckel says, it’s exciting to see “a biotech brand delivering such efficient results” in the skincare world.